Companies that optimize price increase campaigns achieve up to a 80% fulfillment rate on their initial target, a 20% to 30% improvement translating into 0.5% to 1.5% additional EBIT per year. This is undoubtedly a project with one of the highest and quickest ROI for Parcel Networks. Many companies apply “over the board” price increases: if the inflation is 2% and the market is booming they try to pass a 3% price increase to customers and if the market is tough a 1%. However a detailed analysis of contract prices almost always reveals that comparable customers (in terms of volume, industry, geography, etc.) pay very different prices for the same service. 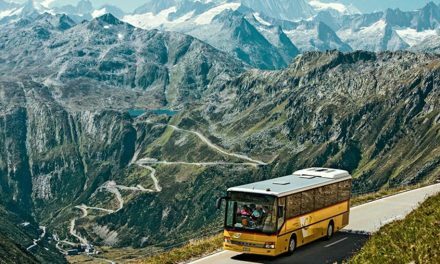 If we consider pricing factors such as cost of service, price sensitivity and customer lifetime value, a high and unexplainable dispersion of prices remains. The first step is then to identify the factors that shall make the price and how much each factor level shall influence the price: we call this model the fair price. This is an excerpt for a parcel network. In this case the customer shall receive a 15% discount off the reference/list tariff. 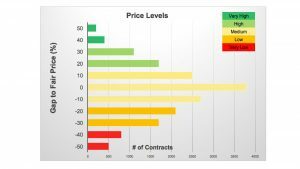 Once this fair price is calculated for each contract, we can identify the contracts with a price higher than their fair price and those with a price lagging behind. 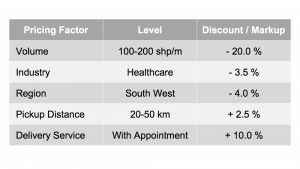 A price level is assigned to each contract depending on the gap to the fair price. As in this example, we usually find gaps of more than 50% between the fair price and the actual price. For this reason, companies shall not apply the same rate increase to all contracts and shall be more flexible with some customers than others. The price analysis also enables to identify contracts that may be at risk due to a price much higher than market price (the price of recently acquired customers being a good proxy of the market price). The fair price model is set up based on the analysis of correlation between prices and pricing factors across all contracts and shipments, market knowledge (value of the service, competition, costs) and the strategy of the company. For the model to be valid, we must check that the distribution of gaps to fair price has a median value close to 0. A second step is to define the rerating rules based on the price level and other factors such as contract tier (Large, Medium, Small), growth rate, quality of service, etc. The following table illustrates a typical example of rerating rules. 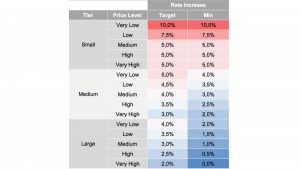 The rate increase target corresponds to the new tariff that will be communicated to customers and the minimum is a guideline for sales in case of customer resistance and risk of losing the business. We then simulate that the application of these rules on the full customer portfolio is in line with the expected price effect of the campaign. Rerating rules are not limited to applying a percentage increase to current tariffs but may also include changes to the price of special services and supplements, migration to standard tariffs in order to simplify price management or migration to new pricing models. 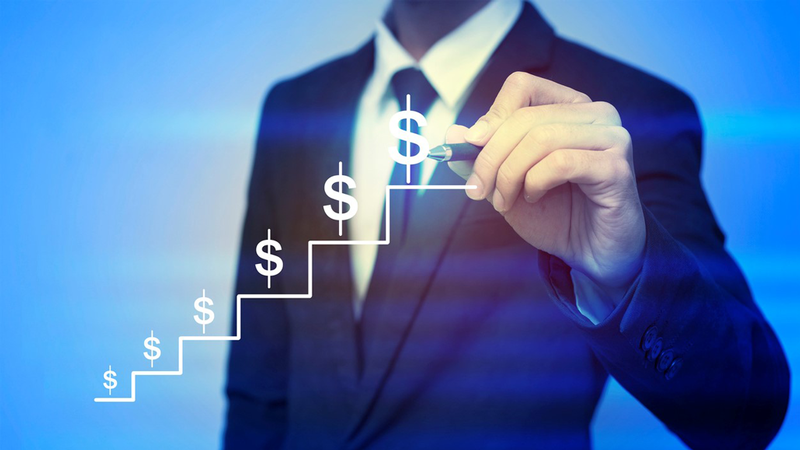 It is critical to clearly explain the rationale of the price increase to customers. Typical arguments are cost increases (linked to general inflation or industry relevant indexes) and company investments in product/service improvement. It is also important to explain to low price level customers that the company does not reach expected profitability with their business and that they benefit from a price much lower than similar customers. Low performance in terms of margin or price level is often due to a lower volume or a shipment profile less favorable than expected at contracting time. A typical example is a customer with an anticipated mix of international (higher margin) and domestic (lower margin) shipments and that only ships domestic. Being transparent about the rationale of the price increase is very important because customer resistance is often emotional. This requires to present the tangible facts motivating the price increase, and data to support these facts. For example: ability to benchmark the price level with peer customers and to compare the actual shipment profile with the profile stated in the contract will help account managers to justify a substantial price increase. Most customers in the Small tier (and many in the Medium tier) are less price sensitive and will not react to tariff updates. For this reason it is preferable to communicate tariff updates with a link to the new tariff without quantification of the price increase effect (avoid to say “we have increased your price by x%”). Those customers will compare the new tariff with the current tariff will in general only check the rate of core products, most used destinations and weight bands and will not look at less frequent ones. For this reason it is easier to increase these “hidden” rates. However, for Large customers, account managers must be ready to provide detailed explanations and impact simulations. Open Pricer provides all the required analyses for this exercise. At this stage, some customers may complain and refuse the new tariff. It is hence necessary to provide key account managers with room for negotiation. This is the objective of the minimum rate increase defined in (1). Below this level key account managers must request management and pricing department approval though a workflow. For Large customers, a rate increase lower than planned or an exemption should be the result of a trade-off for increased volume or change of service level resulting in lower costs. A good practice is to make conditional exceptions such as fulfilment of a specific customer commitment that will be monitored over time. The last step of successful campaigns is to measure in real time the price and volume effects globally, by customer and by sales team/portfolio. To achieve this, it is necessary to compare over 3 to 6 months (the monitoring period) the revenue generated by the new tariff versus the revenue generated by the previous tariff. Because they receive compensations mainly based on revenue, account managers often adopt a cautious attitude during price increase campaigns and find good reasons why their customers (particularly large ones) should be exempted. Companies running successful price increase campaigns measure the impact of the campaign by sales team and portfolio and introduce rewards and specific compensation to incentivise account managers. Thanks to Open Pricer, account managers can simulate the expected impact of the campaign and then check its actual impact by customer. 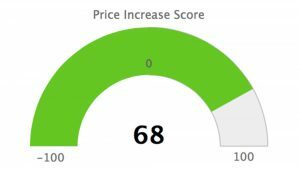 They can see in real time their price increase score that summarises their performance: from 100 – if rate increases targets are achieved for every customer in the portfolio, to 0 – if, in average, minimum rate increases are secured (-100 corresponding to no price increase). 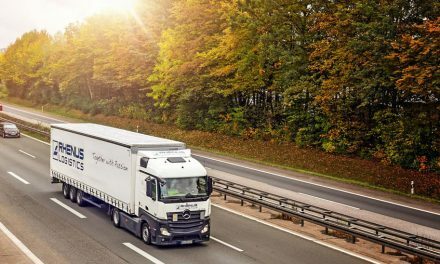 About Open Pricer: Open Pricer enables parcel networks to optimise and effectively manage prices to reach profitable growth with a typical effect of 2 to 3 points of additional net margin. We have developed an in-depth knowledge of your business by working with market leaders. We can help you improve pricing strategy, optimise price increase campaigns, build accurate quotes and effectively monitor customer contracts.